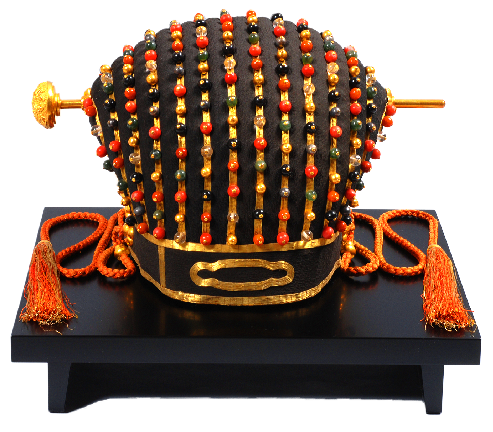 The Royal Crown is also called HIBENKAN or TAMANCHAABUI. Along with a formal costume gifted by the Chinese emperor, it was a formal wear for the king at such nationally significant events as SAPPO (enthronement of the king) and the New Year's celebration. Black silk crepe was attached to the crown's surface, and 12 of tape shaped golden threads were sewn on it. 7 kinds of 24 beads - a total of 288 beads - including gold, silver, coral, and crystal were tacked on each golden thread. A dragon, the symbol of the king, was engraved in the golden ornamental hairpin. Covered food box (ukufan) in cinnabar-lacquered wood. This is one of the three ceremonial items (NUUMEUSURII). Rice was served with this, called UKUFAN, which was used for ceremonies and banquets at a castle. 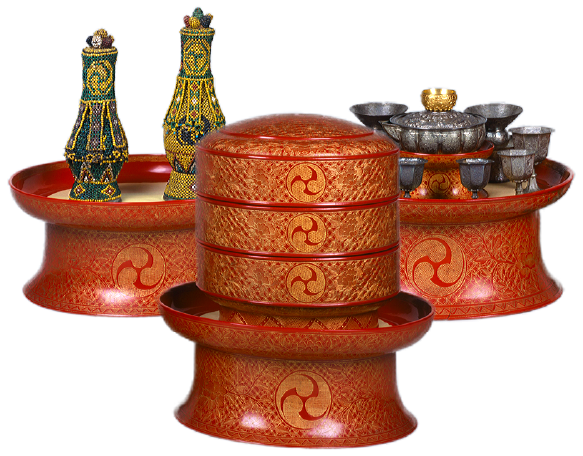 This two-tiered food box has a raised lid, and top of the lid and each tier feature astragal pattern. HIDARIMITSUDOMOEMON, the family emblem, and BOTANSHIPPOUTSUNAGIMONYOU were inscribed on cinnabar-lacquered wood with sunken gold. The curved edge of the lid and the curved bottom part of the body were made by KENTAIKOUZOU (wrapping thin strips of wood or bamboo around a concentric form). 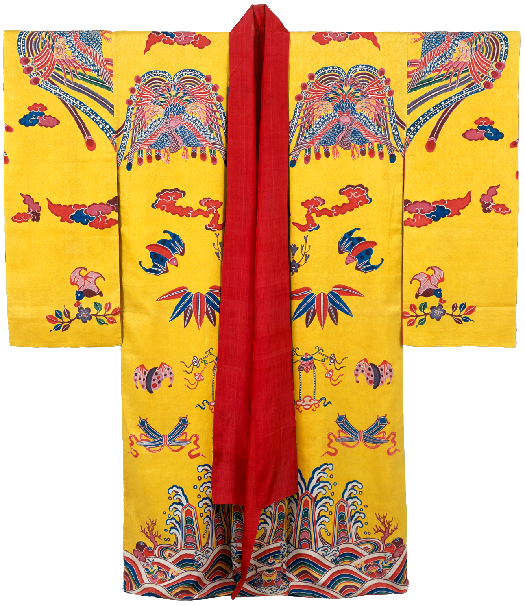 This is a BINGATA-dyeing costume with typical Chinese auspicious omens motifs which included: Chinese phoenixes and auspicious clouds on the shoulders and the back, steep mountains, big waves and flaming gems on the hems, and bats, bamboos and cloves on the torso. KAISUIKOUGAMON, stylized sea waves and big waves patterns that were used for the official uniforms during the Qing Dynasty, was printed on this costume. This pattern corresponded with the hems of the ceremonial costume for the Kings. Since this was a high-class pattern, it is considered that it was worn for the official occasions.